Dreamings Women’s Ceremonies; Bush Tucker (Black Seed and Exploding Seed from the Mt. 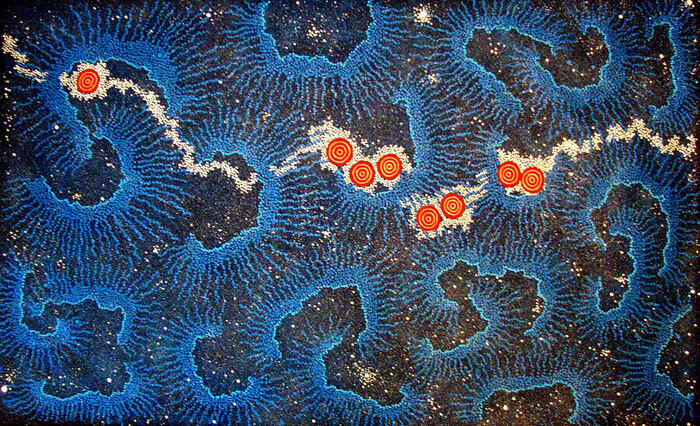 Allan area); Goanna; Serpent; Seven Sisters Dreaming (Milky Way Dreaming); Grandmother’s Gold Country Dreaming. Born in Mt Allan, Gabriella Possum is the elder daughter of the renowned painter, Clifford Possum Tjapaltjarri (c.1933-2002), who taught her to paint. Gabriella attended Yirara College in Alice Springs. Gabriella designed several record covers and also some T-shirts for CAAMA. Gabriella has a high profile in many Australian commercial galleries and is represented in a number of commercial galleries overseas. Gabriella lives with her husband and children near Melbourne, Victoria. 2008 Commissioned to paint a 20 metre art installation depicting Grandmother’s Country for the 2008 RHS Chelsea Flower Show. This installation was awarded a Gold Medal.